Pure fun and destined to be the most popular book in my class library. 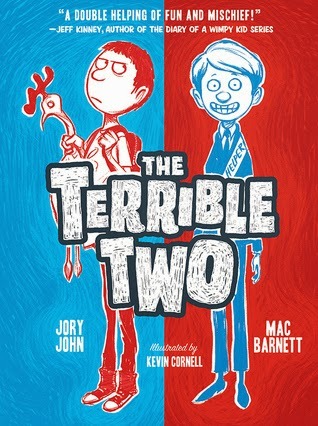 I learned about The Terrible Two from a student who was reading it. One look at the cover and I was asking to borrow it when he finished. Then another boy was reading it on his Nook. (We've had an explosion of Kindles and Nooks in my classroom this year. My heart grew a thousand times.) Kids are circling it on my desk, debating whether both boys on the cover are pranksters, when one looks so innocent. I hang up all the covers of the books I've read and one of my lower level readers said one of her goals was to read a book that I've read. (See what I mean about my heart?!) This is the book I will recommend. Hooray for The Terrible Two! When Miles moves to a new school, he is determined to continue his reputation as a legendary prankster. There's only one problem: the school already has a mysterious prankster and he or she is way more clever than Miles! This is a book to read for its funny illustrations, random cow facts, aspirational pranks, and the fact that it makes turtlenecks cool. The Terrible Two is essential.